We need to clear more landmines every year, not fewer. So the latest report from the Landmine Monitor makes for depressing reading: deaths from landmines are at a 10-year high, while funding for clearing landmines is at a 10-year low, and there was a decrease in the amount of land being cleared every year – from 210 km2 in 2014 to 171 km2 in 2015 . With the USA being the single largest financial supporter of humanitarian mine action , the latest developments on the political scene there may indicate that funding will continue to decline, perhaps at an accelerated rate  with who-knows what impact on clearance rates. So, we have to do more with less; and that means we need to speed up the process of clearing landmines itself. As part of this global effort , a team of engineers in the Department of Informatics at King’s College London are developing an explosives detector that will help speed up the process of clearing landmines by reducing the number of false alarms. This is the problem with metal detectors: most modern landmines are what’s called “minimum metal landmines” – their casings aren’t metal, but plastic or wood; so in order to be able to detect the small amount of metal they contain, the sensitivity of the metal detector has to be turned up to the point where it detects not just landmines, but also any other metal that might be present in or on the ground – discarded nails, cans, broken-off bits of machinery or vehicle parts etc. These are “false alarms” and make the process of clearing landmines very slow indeed, as every one of them has to be investigated as if it is a landmine. That’s what makes an explosives detector such an attractive prospect, especially one sensitive to the presence of bulk, rather than just traces of, explosive; it will definitively say if a metal-detection response is due to the presence of a landmine or not. The KCL explosives detection technology uses pulses of radio-waves to excite responses in explosives at characteristic frequencies. That’s what gives the technology its discrimination: as the frequency of the response and the way it evolves in time are characteristic of a given chemical compound, the system never confuses an explosive for anything else (or indeed one explosive for another). So what’s the catch? The signals are weak, the system needs several tens of seconds to accumulate enough signal to make a decision as to whether there is anything there or not. That’s why this technology has never found an application in military circles, where speed of operation is a key factor. 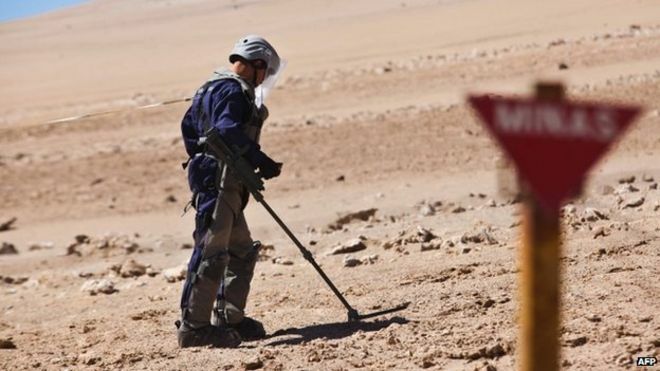 This is much less of an issue in the humanitarian (post-conflict) environment, where the over-riding requirement is to find every landmine – it’s still quicker than digging up every bit of metal the metal detector alarms on. But this creates an additional complication: with no military market, there’s no rush of companies willing to invest in the technology’s development as they could never hope to recoup their development costs through big-ticket, high-volume sales. So funding for development needs to come from other sources – governments, NGOs and the public. Finding that funding is a challenge in the current climate, but it’s a challenge the King’s team are ready to meet.